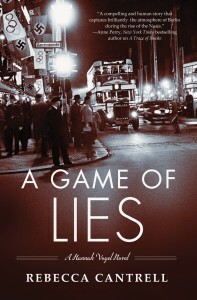 A Game of Lies by Rebecca Cantrell is available from Amazon.com and Amazon.co.uk and many other retailers. You can read more about the author and this title at her website. The third instalment of the ‘Hanna Vogel’ series could not be more perfectly timed, with its events taking place around the 1936 Berlin Olympics. If you’re unfamiliar with the series (as I was until I was asked to review this book), the central character is a German female journalist working under an assumed name, leaking Nazi secrets to the British via Switzerland in the run-up to the Second World War. Lack of familiarity with the wider story is no obstacle to the reader, however, since A Game of Lies stands up perfectly well as a self-contained narrative. The plot is essentially a detective story and espionage thriller combined, with the protagonist trying to uncover the truth behind the apparent murder of her friend while struggling to maintain her cover as a Swiss journalist covering the Olympic Games. Complicating matters is her uneasy alliance with a guilt-ridden, alcoholic SS officer who may or may not be setting her up—incidentally, he also doubles as her romantic interest—and the obligatory MacGuffin, in this case a rare stamp valuable enough to be worth killing for. From the outset it is striking how readable this novel is, and this is maintained throughout. Rebecca Cantrell’s writing style is lean and accessible, well suiting the subject matter and tone. Towards the end of the novel it becomes clear how deceptively tight the plotting is, when various threads come together and partly unravel again to avoid tying up too many loose ends. The characters tend to be either wooden or cartoonish (especially the villains), but this hardly matters in what is an overwhelmingly story-driven piece. A Game of Lies’ strengths lie in its set pieces, including an amusingly observed episode in which the protagonist has to function while under the influence of opium, and a satisfyingly tense climax which I will not spoil by describing it here. Low points are the protagonist’s sporadic meditations on the family left behind in Switzerland, which seem a little trite and unconvincing, but which perhaps make more sense within the series as a whole. This is a minor quibble, however, and A Game of Lies comes out on balance as an enjoyable and deftly executed piece of storytelling.